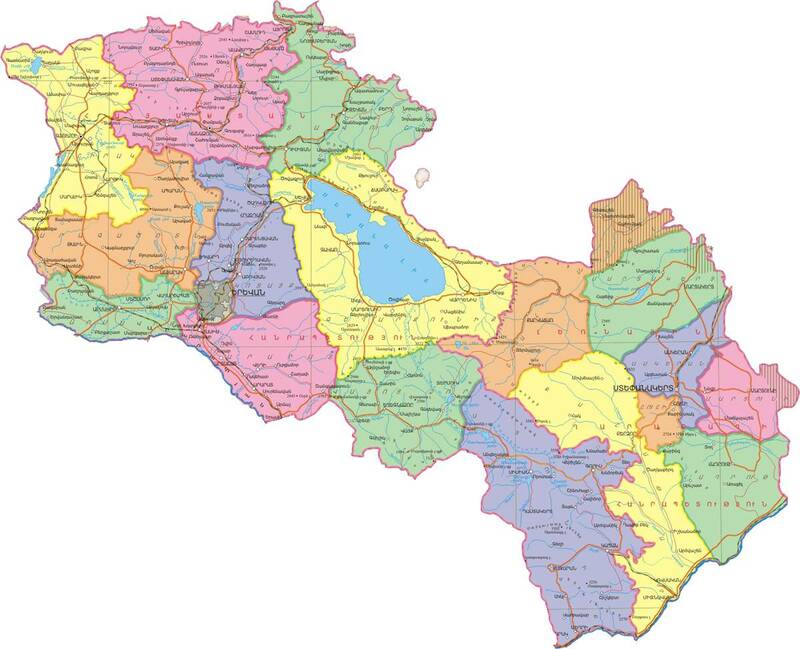 Armenia (officially the Republic of Armenia ) is a landlocked, mountainous country in Transcaucasia. Geographically, Armenia is located in North-Western Asia, but because of cultural and political objectors is often considered to be a European country. It shares borders with Georgia in the north, Azerbaijan in the east, the Nagorno-Karabakh Republic in the south-east, Iran in the south, Nakhichevan’s Autonomous Republic (which is a part of Azerbaijan) in the south-west and Turkey in the west. By the beginning of the 20th century the name Armenia refered to the entire Armenian Highland, which stretched from Euphrates and Tigris rivers’ basin to the eastern part of the Small Caucasus. The native population of the Armenia’s western part was killed and displaced because of the Armenian Genocide in 1915 and the eastern part gained a short-term independence in 1918. As a result of the referendum held on 21 September, 1991 Armenia got its independence. Before that Armenia was one of the 15 republics of the Soviet Union. Artsakh , another region of historic Armenia, which had the status of an autonomous region of Azerbaijan SSR, also declared itself independent on 10 December of the same year, but in contrast the Republic of Armenia, it got no international recognition. The Constitution of Armenia was adopted on July 5,1995. On November 27, 2005 the constitution was amended by a nationwide constitutional referendum. According to this constitution the Republic of Armenia is a sovereign, democratic, social, and legal state. Armenia is a member of the United Nations, the Commonwealth of Nations, the Council of Europe, WTO and over 40 other international organizations. Armenia is located in Transcaucasia between the Black and Caspian Seas, but it has no entrance to the sea. To the north it is bordered by Georgia, to the east by the Nagorno-Karabakh Republic and Azerbaijan, to the south by Iran and to the west by Turkey. Armenia is a mountainous country. 76.5% of the territory is on the height of 1000-2500 m above sea level. The mountain ranges of Armenia occupy about 14.000 km ² or 47% of the total surface. The plateaus make up more than one-third of the country’s surface or over 11.000 km². The highest point is Aragats mountain 4090 m and the lowest one is the underflow part of Debed river 375 m.
The longest extend from North-West to South-East comprises 360 km and from West to East 200 km. Vardenis – 3.522m and so on. Lake Sevan is the greatest water basin in Armenia, its surface comprises 1263.5 km ². The longest rivers in the Republic of Armenia are Araqs, Akhuryan, Debed, Vorotan, Hrazdan, Aghstev, Arpa, Qasakh and so on.